"Join us! You're just in time for the hootenanny." Hootenanny was something of a bold experiment in forward thinking, an ABC series hosted by Jack Linkletter (son of Art) that ran for just a year and a half, between April 1963 and September 1964. The strumming glee of the folk music movement had been taking a firm hold on college campuses across the country, so what better place to stage a weekly series of half-hour concerts, offering a mix of folk (The Limeliters, The Journeymen), country/gospel (The Carter Family, Flatt & Scruggs) and even comedy (Bill Cosby, Woody Allen). And these were all live performances�no lip-synching or prerecorded music beds�from a myriad of performers, most of whom were, in one way or another, planting the seeds of an imminent musical and political evolution. This three-disc set from Shout Factory resurrects over four hours of material from the show's 18-month run�serving as something of a primer and time capsule of the musical world on the precipice of the British Invasion and all of the changes that would help bring about�where an audience full of clean cut college kids on a Saturday night would find the boys in suits and ties and girls in nice dresses. Coincidentally enough looking just like the performers themselves, who would encourage hand-clapping sing-a-longs, as with the almost nerdy yet jovial goodness of The Tarriers rendition of Wimoweh (think The Lion Sleeps Tonight if you need a "popular" reference point). Yes, it's just like A Mighty Wind. Only real. The undercurrent of veiled protest is still here if you squint and read between the lines (see The Chad Mitchell Trio take on the then radio-banned The John Birch Society), but the reality is that ABC bowed to pressure and put a squeeze on more popular "extremist" folkies like Pete Seeger, who was essentially blacklisted from appearing. That act of control was one of the eventual big nails in the show's coffin, and it led to other "name" acts like The Kingston Trio to back Seeger and not appear on Hootenanny, effectively cutting off the presentation of the real folk movement at the knees. So even with what seems like a preponderance of New Christy Minstrels-ish mix of traditional folk tunes (Kumbayeh, If I Had A Hammer) there are still the spot on moments of more pronounced social commentary�such as Leon Bibb's version of Little Boxes�to put a reminder out there that the younger generation wasn't all that happy with the status quo. The show's theme song promises to "raise the roof and the rafters with song" and to "hoot and holler, and raise a mighty Caine", which even with the behind-the-scenes attempt to water down the movement's growing extremism stills shows through here. A couple of songs by Johnny Cash (easily one of the more well-known acts on this set) blends in seamlessly with lesser knowns like The Travelers Three or The Simon Sisters, giving Hootenanny its sense of treating the music as the message, and not simply catering to the use of big name marquee performers and trying to call it folk. The absence of movement icons such as Seeger or Peter, Paul and Mary is troubling in one regard, but the strange innocence and unity that this music represented is kind of like seeing a living thing just before it undergoes some great transformation. Image Transfer Review: The 1.33:1 fullframe presentation was culled from surviving kinescopes, because as liner notes indicate all other recordings have been lost. Hence, the black-and-white video quality tends to look a little smeary in spots, often marred by hazy edges and varying contrast levels. There are also some assorted periodic bits of print damage, but overall the presentation and preservation is not all that bad, considering the source material. Audio Transfer Review: Audio for these live performances are presented in 2.0 mono, and it's impressive that the sound quality is as strong as it is, given its history. Even with some occasional clipping that does occur periodically, the majority of the acts sound clear enough to sing along with, and that's what it's all about here. Extras Review: Packaging for this set is three thinpak cases inside of a cardboard slipcase, with artwork on each interior case carrying artist/song info. With well over four hours of material, the lack of any particular extras isn't all that glaring, because there is a whole lot of music here. 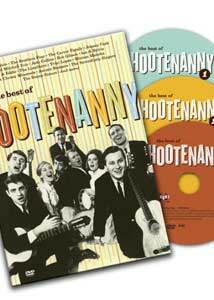 Disc one carries the only extras, mainly a set of three Shout Factory trailers, as well as an interesting six-page booklet written by folk producer Todd Everett discussing the Hootenanny experience. The chapter stops (one per artist) are broken out with 28 (disc 1), 33 (disc 2) and 30 (disc 3). Here's a curious and important piece of musical history from the early 1960s, from a time when clean cut folks in suits, ties, and dresses were truly laying the groundwork for the whole protest movement to come by the end of the decade with an infectious and perky sing-a-long presentation. Cutting edge on a number of different levels, this set captures a generation on the cusp of major musical and political upheaval.